Mr. Davutoğlu once claimed that he knew Syria and the Middle East polity so well that, in his words, he "traveled to Damascus 62 times and knows the city street by street." 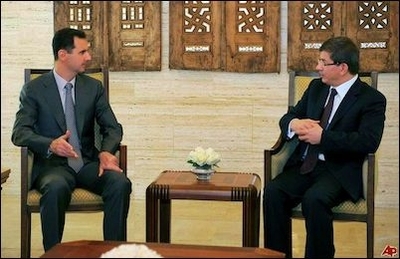 That was when Mr. Davutoğlu and his eternal boss, (then-Prime Minister) President Recep Tayyip Erdoğan, were still the best regional allies of Bashar al-Assad, at just about the time when they, all of a sudden, realized that the dictator of Damascus was in fact the dictator of Damascus and not a modern-day, Syrian reincarnation of Martin Luther King. Mr. Davutoğlu has since hoped to travel to Damascus for the 63rd time so that "we all can pray there," a not-so-subtle reference to his commitment to "the conquest," which, in this case, denotes a passionate but not necessarily conscious desire to topple the bad Shiite men in the Syrian capital and replace them with the bad Sunni men. That desire, in all its semantic message, looks very much like a wish to pray at a mosque in "conquered Moscow." But Mr. Davutoğlu probably knows the streets of Damascus better than the Russians, so the important men in Moscow have good reason to be scared - including being scared by the possibility of a spasm of laughter. Once again, what Ankara wishes is self-contradictory: Cooperate with the West in a way that wins hearts and minds in the West but so discreetly that the Islamic State of Iraq and the Levant (ISIL) does not notice. No doubt, Erdoğan, Davutoğlu & Co. do feel that their Western allies need their services more than before to tackle the Frankenstein that the same company created after getting lost in the streets of Damascus despite 62 visits. The Turks have a confused mind but probably think that this could be an opportunity to revive their illusions of how a Sunni-led belt subservient to Turkey should take form below them. Once again, what Ankara wishes is self-contradictory: Cooperate with the West in a way that wins hearts and minds in the West but so discreetly that the Islamic State of Iraq and the Levant (ISIL) does not notice; create super-cyber anti-terrorism counter-measures so that ISIL cannot "hit" cities and "our popularity ahead of elections"; win a Western commitment to make sure that al-Assad should be toppled; challenge Russian interests but make sure other strategic interests do not conflict and trade keeps on booming; play the peace game with the Kurds, support the Kurds against ISIL, but not too staunchly or too publicly; do not support the Kurds against ISIL out of fear of a military backlash in case peace talks fail; thus, look pretty to everyone involved: The West, the Kurds, ISIL and Islamists at home and in the neighborhood. Bon voyage, gentlemen. The famous peace process between the Turkish government and the autonomy (and later, independence)-minded Kurds is a game of mutual pretension, with Ankara being the likely loser in the end. It is revealing that the worst Kurdish uprising in the last 22 years came at a time when Mr. Davutoğlu's government should be fast progressing with its peace talks with the Kurds. All the same, in the last few days, the death toll has risen to 20, with hundreds injured, including 170 policemen; curfews in six cities and 22 towns; Turkish consulate buildings in France, Austria and Switzerland attacked; and in Turkey, 3,000 shops and businesses, 263 public buildings, 190 bank branches, 80 party buildings, 556 vehicles, 30 student dormitories and society buildings destroyed. This is how Turks and Kurds are to shake hands for a historic peace. Perhaps for a better future, Mr. Davutoğlu should revisit Damascus 620 times, northern Syria and Iraq 1,620 times and Diyarbakir 16,200 times. And, of course, he should know every Kurdish, Shiite, Nusayri, Alevi, Arab, Shiite Turkmen, Sunni Turkmen and mixed city "street by street."